4″ f/13 single-arm alt-az mount Maksutov. 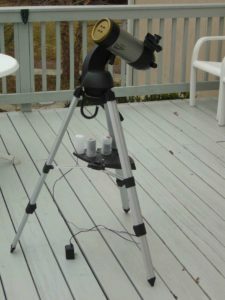 Includes red LED StarPointer, tripod, 120VAC transformer power supply, 40mm, 25mm and 10mm eyepieces and a user manual. Go-to and tracking capabilities. 4,000+ object library in the keypad. Stored by/Loaned to: Ed P. Available for checkout.